The Wardrobe Theatre is a little gem, tucked away in the back of a pub in Old Market, Bristol. The L-shaped seating arrangement and perfectly-tiered seats make it a very child-friendly venue. 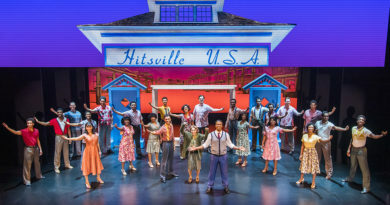 Today’s show was aimed at children 4+ (and their families of course) and it was just right in terms of length, tone and venue for the pair of 6 and 7 year old girls that I took to see it. My daughter is a theatre veteran, and she knows that one person can be several different people just with changes in voice and stance, she’s wise to the idea of a person and a puppet of that person playing the same character, and she completely gets that if someone says ‘look at my beautiful sparkly shoes’ then it doesn’t matter what you’re actually seeing, sparkly shoes is what they’re wearing at that point. Her friend was less certain at first – I could hear a quiet running commentary of ‘it’s not REALLY a classroom’ and ‘Those shoes aren’t sparkly, they’re just normal’ – but she quickly got the idea and both of them were fully engaged with the story throughout. 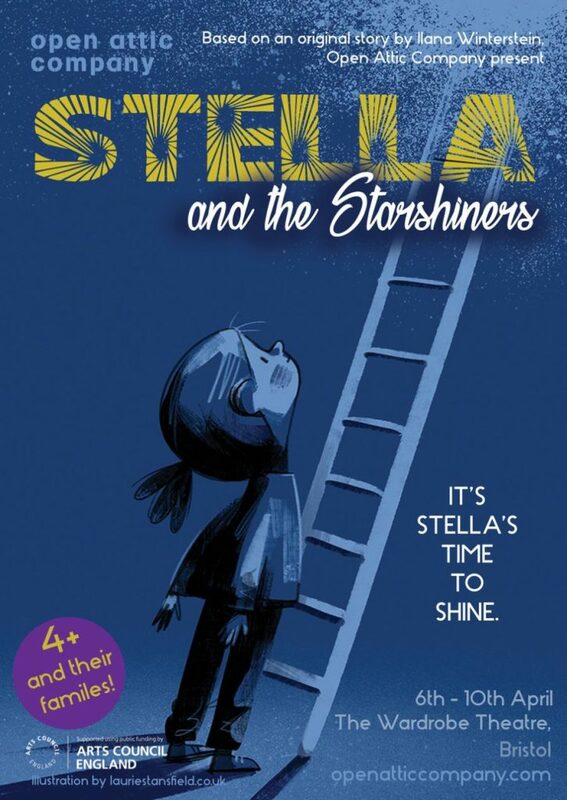 Stella and the Starshiners is a simple story of a girl who initially tries to climb and fails, and is mocked and excluded for this for many years. 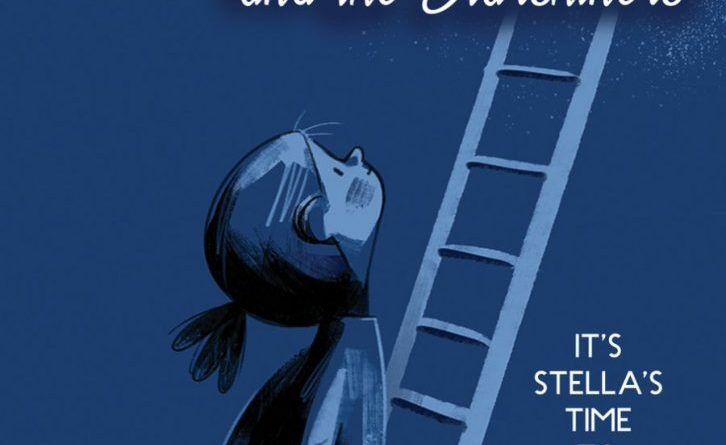 She finds her own way of living, tries again and this time climbs all the way to the top, brings some kindness and joy to her little world and eventually decides that although she’s happy that she has shown she can get up that ladder, it’s not what she wants to do with her life. I could hear little voices next to me saying ‘It’s like when I couldn’t get up that ladder in the park, and I kept trying and didn’t give up’ and ‘It’s fine to not like doing some things’. I think Open Attic did a very good job of getting their message of hope, effort, kindness and being yourself across to them. There are only two actors (Adam Blake and Emma Keavenay-Roys) on the very simple set but the whole village is there – Harold (‘He’s just a big show-off), the Mayor who can’t be bothered to remember Stella’s name, the teachers who tell her she can’t do anything because she vomited on the one and only time she tried (and was allowed to try) to climb a couple of steps on a latter. It’s beautifully done, and the minimal set is surprisingly effective, especially with the hanging stars at the top of the ladder. And of course the puppetry – puppet Stella’s sadness when her fellow villagers were being cruel was poignant, and her long climb up the ladder with us all singing for her and willing her up was wonderful. We all enjoyed it, though when I asked the girls for their reviews I got this feedback: ‘I didn’t like their dungarees’! Well, apart from the fashion critique, they were very positive and said they loved the show. I’m really glad we saw it, it was both an engaging and well-told story and an inspiring lesson that the girls could relate to, and I’d definitely recommend it to other families.